To take forward the Archdiocesan pastoral plan effectively, Archbishop Thomas D’Souza has had interactive meetings with all our priests, deanery wise, and gave a brief summary of the genesis of the process of the Pastoral plan, which was officially inaugurated during the Chrism Mass 2013. Animation of the six concerns had been completed throughout the Archdiocese earlier. And now, with this renewed inspiration, another Six Concerns will be completed on 18 July 2015. The schedule can be seen in the table below. The work of the Pastoral Plan begins at the grassroots, our parishes. The diversity of our parishes -spread over a huge area of urban, suburban and rural Bengal - need infectious dynamism to kickstart and continue the momentum required for the implementation of the plan in ways relevant and possible by each parish unit. This huge task is being fulfilled through the Common Zonal Animation Programmes, where the core elements of each concern, evolved out of the working papers over the last two years, are presented in a simplified way to representatives of the parishes – Parish Pastoral Plan Core Team Members, and potential parishioners - to take up each concern in their local setting. The Animation programme is “common” because the content and format is the same, wherever it is held. Animators representing each of the concerns present the Pastoral Plan paper of their commission, followed by a short interaction with the parish groups gathered. After all the concerns to be taken up are presented, there is parish-wise workshops, which help the groups to already map out a rough plan of action, even before they return to their parishes to animate and implement. The Archdiocesan Social Communications Commission (ASCC) is providing the moderators and reporters for all the ZAPs held, making sure we have a reliable record and well-conducted programmes. We are grateful to them and their team of persons who helped in moderating and reporting. Now we need to look into the actual process of activating the Parish Pastoral Plan in our parishes. In this regard, Sunday 9 August 2015, has been set aside as Parish Pastoral Plan Inauguration Day in the Archdiocese of Calcutta – when every parish will begin the mission of the Pastoral Plan process. Brief reports, Deanery-wise from the ASCC on the ZAP events of 27.06.2015 are carried below. Next week the reports of the ZAP events of 04.07.15 will be carried here. A total of nine Parishes from Zone I and Zone II attended the Zone-wise Pastoral Plan Animation event held at the Archbishop House, Kolkata, 27 June 2015. After a short reading from scripture by the Vicar General Fr. Dominic Gomes, who also led the parishes in prayer with a hymn he played on his guitar. Opening address was by Fr. Vincent Lobo, the Dean of Kolkata; thereafter, the proceedings were handed over to Althea Philips, the moderator for the day. The day’s sessions dealt with the papers of six different commissions, each who sent an animator to present their paper. Ecumenism and Inter Religious Dialogue was presented by Sr. Mary D'Souza, Education was presented by Sr. Joicy Madaserry, Health was presented by Dr. Mary D'Cruz, Laity by Ms. Bemvinda Pereira, Social Communications by Mr. Farrell Shah, and Environment and Social Development by Mr. Stephen Gonzalves. Most presenters took the participants through the relevant history of the church, the past and current teachings of the church in the particular field of discussion and also the light and shadow situation in the current context of the Archdiocese, before delving into the goals and action plans. Education by Sr. Joicy and Environment & Social Development by Mr. Gonsalvas proved to be very important for the participants - with the largest number of interactions by the parishes on these topics. Most people had divergent views on the way our Catholic institutions handle admissions of Catholic students, and Sr. Joicy clarified that at least at her institution no Catholic child is turned away at the entry level. Ms. Bemvinda Pereira held a very dynamic session which touched on the importance of the Laity in today’s church; while Mr. Farrell Shah took the participants through the steps that the Archdiocese has taken to improve communication as a whole. It was surprising to know that just about 7 out of the 50 odd participants knew of the existence of an Archdiocese website (www.archdioceseofcalcutta.org). After the presentations by all the six commissions, a small workshop was held, where each parish got together in a huddle to discuss how they can implement the various action plans discussed. The day ended with lunch. 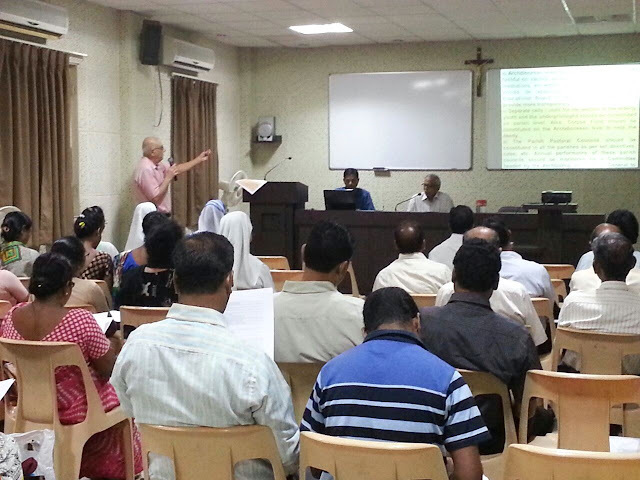 The Midnapore edition of the Zonal-wise Common Animation Programme of the Archdiocesan Pastoral Plan was held at Kharagpur SKC, 27 June 2015. 6. Christ the King Mission Church, Balichak, led by Fr. Edward Minj, with 13 members, the largest delegation. Designated reporter was Ms. Lily Prasad. After the opening prayer by Fr. Godfrey Fernandes, Catholic Church – Ghatal, there was a short introduction by Fr. Shyam Charan Mandi, SKC, Hijli. Fr. Ambrose spoke on how to form Pastoral team. He, along with Ms. Dhanalaxmi Kaliram, was Moderator for the day. The first presentation was on Ecumenism & Interreligious Dialogue, presented by Mr. Dilip Gomes. After which Fr. Joy D’Souza spoke on Education, which he said is a part of our Human Life and Jesus is the Teacher of our life. Education is therefore a must for all. CBCI wants us to teach the student the life wisdom, knowledge, values and how to become selfless persons, and in doing so, change society for the better. Social Communication was presented by Ms. Ruth Joseph. She spoke on the different communication means in our modern lives, for example, mobiles/tab, computers, etc. The bottom line - Jesus is our Mass Communicator. Mr. Dilip Gomes again stepped up to animate on Laity. He opined that there was no real empowerment of laity seen yet, though we are talking of commissions. The Health concern was taken up by Fr. Joy who expressed that 25% of the healthcare services in the country are done by the Catholics, especially nuns. Jesus is the biggest leader in healthcare! At the event’s close, Fr. Ambrose thanked all the resource persons and wished all parishes present the best in this mission. Zonal level of the Diocesan Pastoral Plan Zonal Animation Programme was held for Zone I at St. Patrick’s Church, Dum Dum, and 27 June 2015. Zone I is: St Patrick’s Church, Dum Dum; St. Damien; Church of Our Lady of Lourdes, Barasat; Holy Family Church, Kestopur; Mother Teresa’s Church Dum Dum Cantonment. About fifty persons attended. The programme started at 10 a.m. - delayed by half an hour due to inclement weather. The first animator of the day was Mr. Dipankar Basu, with the Pastoral Plan paper on Ecumenism & Inter-religious dialogue. Linking the Ecumenical movement to the inter religious dialogue he emphasised that in a multi-religious/cultural milieu, the Church wants to promote inter-religious dialogue, by identifying the common, acknowledging the differences and identifying areas of appreciation. Sr. Esther Rani, FMA, presenting the Pastoral Plan Paper on Education and Culture, said to increase Christian values in schools, all Catholic schools must be made aware of the All India Catholic Education Policy 2007 and the Archdiocese Pastoral Plan. Dr. Sipra Goswami, Secretary of Health Commission, spoke of Christian values in health care and highlighted Christ’s work among the sick. She suggested that a start could be made by setting up healthcare centres in each parish. Ms. Mary Ghosh led the next session, the Pastoral Plan paper on “Laity”, she informed the audience of the role of the laity in the Church as recognised by the Second Vatican Council. The laity, thus, abiding by the Second Vatican Council must work in close union with their pastors. Rev. Fr. Robin Gomes carried forward the importance of the laity in the Church through the presentation of the Pastoral Plan Paper on Social Communications. He also gave a word of advice to all Priests and religious to be available 24*7 to guide and help the laity, as well as to improve their communication skills whether off or on the pulpit. The last session was taken up by Seva Kendra Co-ordinator Mr. Mukul Haldar, with the Pastoral Plan Paper on Social development. He highlighted the Seven Principles of the Catholic Social Teaching. Along with the Rights comes the responsibility to pursue peace and care for fellow humans especially the poor. The Programme concluded with a short prayer by Rev. Fr. Hermil D’Souza, Parish Priest of St. Patrick’s Church Dum Dum followed by a short discussion of the day’s program among the representatives of the parishes, so that the seed of concrete plan could be sown while the matter was fresh and the animators were available for queries. 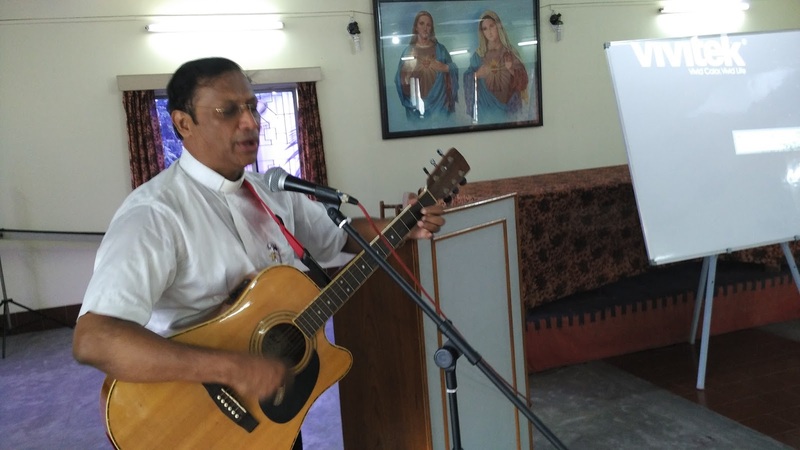 The Common Zonal-level Animation Programme on Pastoral Plan of six concerns was held at Don Bosco, Liluah, 27 June 2015, for Howrah-Hooghly Deanery. Attendees were Parish Pastoral Core Teams and representatives from the following five parishes. Brother George MC began the programme at 9.30 a.m. with a prayer. Dominic Azavedo, representing the Archdiocesan Social Communication Commission (ASCC) was the Moderator and conducted the programme in a masterly fashion within the given time-frame. Ecumenism & Interreligious Dialogue, by Fr. Timir Sinha: He said that Interreligious Unity through Dialogue, Prayer &Meetings of all faiths at regular intervals and gathering on Social issues help our Christian Community to have a better understanding of other religions & beliefs. Laity by Charles Sassoon: The Laity must work closely with the pastors to take up and solve various challenges of human salvation. Through various associations and movements like SCC, SVP, CAB, LEGION OF MARY, YCS, CLC and AICUF, the Laity can work closely with pastors. Health by Sr. Meena Tirkey: Sister mentioned that the Catholic involvement in field of health is born of leadership and ministry of Jesus Christ. “Health” in our Christian understanding does not only mean physical, mental and social wellbeing but also being in the right relation with God. Education by Sr. Grace Mary: Catholic schools are irreplaceable sources of service to the society, accounting for 25% of services provided in this sector. To achieve the goal of holistic education of our Catholic children, it is necessary that no Catholic child is refused admission in schools and colleges, and they can be supported financially to pursue their academics. Social Development by John Francis Osta: Human Dignity is protected and developed when we are in a community which is the foundation of society. Human rights can be protected best when socially-oriented persons use their vocation to serve their communities in the basic, economic, social, cultural, civil and political rights. Social Communication by Isaac Harold Gomes: Isaac highlighted the clergy’s need to be trained in meeting the press, facing the camera, etc. He also spoke on Crisis Management and said that each parish should have a crisis management plan in place. Each parish should have its parish journal for the promotion of healthy interactive (two-way) communication. This was followed by a Workshop where the Parishes formed groups, discussed and noted down the salient points of each presentation. The day ended on a happy note with a sumptuous lunch and hopes of positive action.